Tyson Fury-Deontay Wilder: Precise or Preposterous Result? On Saturday night, Tyson Fury produced one of the best comebacks in a world title bout as a British heavyweight in this century. After suffering personal setbacks with depression and mental illness, Fury said after the bout in a heart-felt interview with BT Sport that his comeback was in the name of those who suffered from personal trauma like his. “It’s an iconic comeback isn’t it?,” Fury said. “I just showed the world tonight, and everyone suffering with mental health problems, you can come back and it can be done. Fury coming in as the challenger was on steady ground with Wilder, who was defending his WBC heavyweight title for the eighth time. Wilder was coming in throwing jabs to the body of Fury but did very little effect. Fury kept moving his head side to side avoiding the big right hand of Wilder. Fury also known as the Gypsy King was using his jab really well against the 6 foot 7 Wilder and was certainly catching the eyes of many spectators. 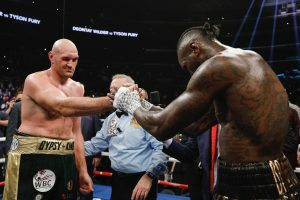 Despite the first sign of Wilder making Fury suffer from a bloody nose in round four, Fury was on the lead with his crisp and flurry combinations, jabbing to the body and taunting Wilder from time to time. After the fifth round ended, Floyd Mayweather was interviewed by Showtime and said that he had Fury winning and that Wilder had to up his game. He said: “Wilder is dependent on just one shot – he’s looking for one big shot – and as a fighter, you have to use other weapons. Fury in round six around the 1:50-1:46 mark, landed a bursting amount of combinations that set Wilder back on his tracks. They were sweet on sight to see but sour for Wilder to taste. In round ten, Wilder threw 31 and landed only one, whereas Fury threw 38 and landed ten. The only two major standouts for Wilder in the second half of the fight was the two knockdowns in round nine and twelve. The 12th in particular stood out the most when Fury went down from a 1-2 combination and looked to be out cold. Wilder was celebrating but thanks to referee Jack Reiss he initiated the count and by God’s grace, Fury got up. Despite the knockdowns, it clearly looked like that Fury had won. But the outcome of this bout went as a draw, with California’s Alejandro Rochin, scored the bout for Wilder 115-111. The lone British judge, Phil Edwards, scored the action even 113-113 and Canada’s Robert Tapper scored their fight for Fury 114-112. Just like the reminiscent of the first bout between Lennox Lewis and Evander Holyfield back in March 1999, in which Lewis out-fought and out-punched his opponent all the way, he too got a draw at the end of it. Speaking as a pundit for BT Sport, he said: “They need to get some good judges, these judges were terrible. Fury with landing 13 more overall punches than Wilder (84-of-327 to 71-of-430). According to those statistics, Fury connected on more power shots (38-of-104 to 31-of-182) and more jabs (46-of-223 to 40-of-248). According to a poll initiated by Boxing on BT Sport, out of over 25,000 voters 85% of them thought that Fury won. Nine percent had Wilder winning and six percent had it a draw. “How after a fight like this can there not be a rematch? It’s a draw and unfinished business. They’re both still undefeated. He won that fight tonight, everybody knows it. We’ll do our best to get it back on again. After the bout, Frank Warren stated that a rematch should happen but only in Britain for a second meeting: “In Britain that’s an 80,000 job, there’s no doubt about that. Everybody’s going to come to see that in the UK. Vegas will be drooling over this. When did you last see a great heavyweight fight in the USA? When was the last time? This bout resurrected the heavyweight division nationally and globally and these two warriors these two fighters deserve all the praise in the world particularly Fury. Going into his opponent hometown and produces a cynical and clinical performance deserves a huge standing ovation. The decision of the bout is preposterous.